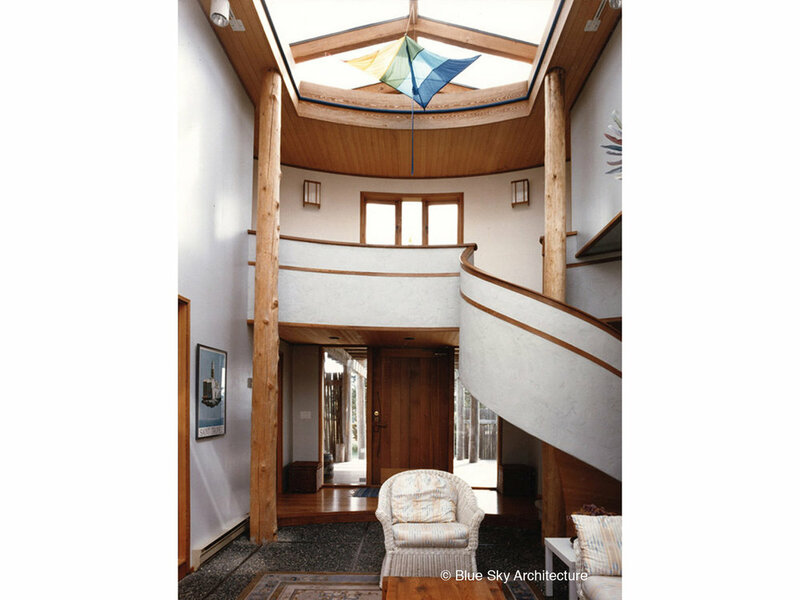 This is an early Blue Sky Design House, designed by Bo Helliwell and Michael McNamara. 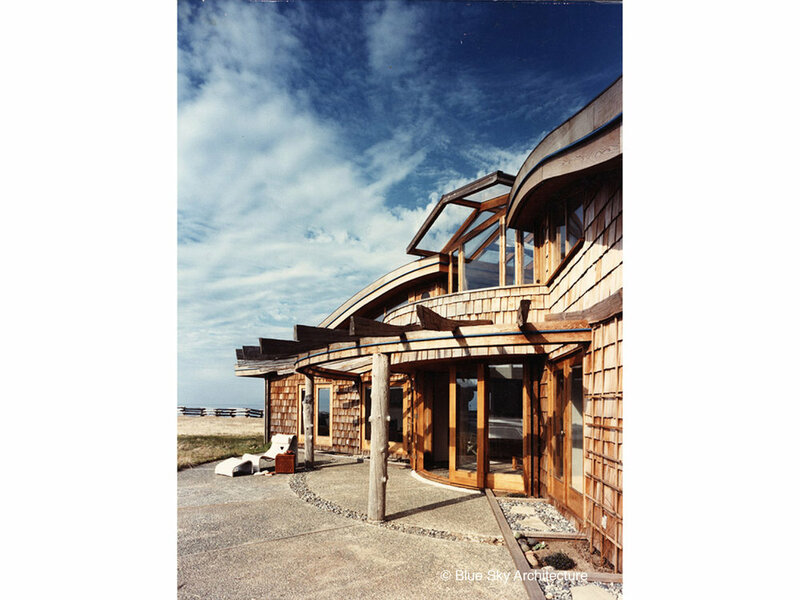 The sculptural lines of the roof and a range of structural/elevational details guide many later houses by this firm, and its successor, Helliwell + Smith/ Blue Sky Architecture. The flanking pair of low roofs shape architectural/ornithological ‘wings,’ thereby generating the “gullwing” name for this shore-nesting domicile. A double story atrium in the house’s center divides the social spaces from bedrooms and provides a passive solar heat sink. On the south facing roof wing, solar hot water panels provide hot water for the home, again, an early application of a now much more accepted green building technologies. Interior spaces of this organic, modern home were designed to be curving, calm and embracing. Inside, a soft palette of white walls contrasts with the natural colours of wood and stone. Over time, the landscape roof has blended with the adjoining meadow flowers and a trellis that supports a thriving grape vine that has become a green wall. 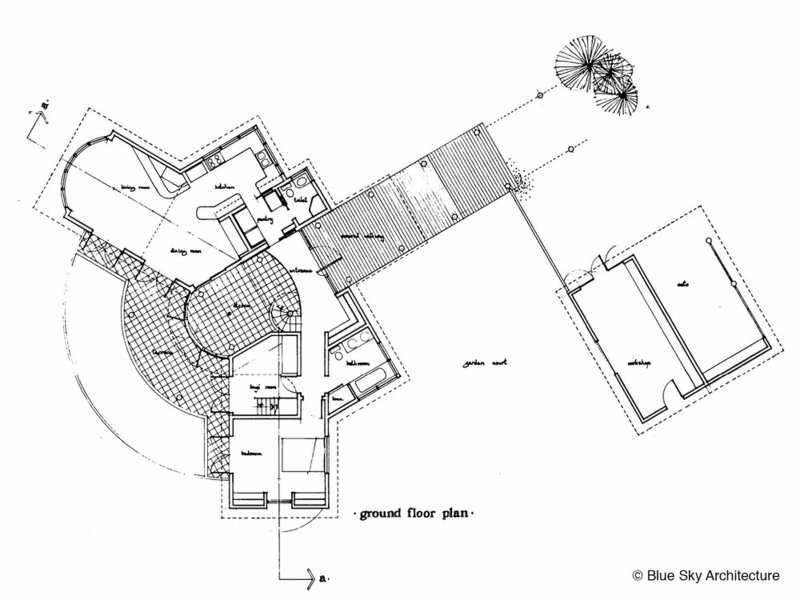 This home was an early example of using both active and passive solar energy as well as green roofs. A graceful and symmetrical roof rises up from the meadow, and because of its being planted with meadow grass and flowers, there is a blurring between setting and building.